Now, while the leaves are still off deciduous trees and evergreens are easy to spot, it’s a good time to check hemlocks for signs of the hemlock woolly adelgid, an invasive insect attacking the trees in every north Georgia county within the native hemlock range. Millions of hemlocks have already died; many more are infested; and ALL are in danger without timely intervention. While the bugs themselves are too tiny to see without a magnifier, their white cotton-ball-shaped egg sacs about the size of a peppercorn are visible this time of year. They may be present by the hundreds or even thousands on the underside of the branches at the base of the needles. Given that each egg sac can contain 30 to 300 eggs, and there are two generations a year, these prolific and voracious piercing-sucking pests, if left untreated, can kill even a large hemlock in as few as 3 to 6 years here where our southern winters aren’t cold enough to set their population back significantly. But there is hope. In addition to cultural practices that help maintain overall plant health, chemical treatments can provide extended periods of protection (an average of 5 years). They have proven highly effective in controlling adelgids, safe when used according to the label, economical especially compared to the cost of losing the trees, and easy enough for most property owners to do themselves. There are also a few professionals who can provide the service. The adelgids will begin hatching soon, so now is the time to take action. All who care about the beauty, environmental health, and economic vitality of our mountain communities are urged to join the fight to save these magnificent trees. Training is available through nonprofit Save Georgia’s Hemlocks for anyone wanting to learn to treat their own hemlocks and/or help save trees on our public lands. 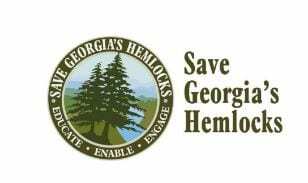 Please visit www.savegeorgiashemlocks.org or call the Hemlock Help LineSM 706-429-8010 for information.